A copy of this novel was provided by Bloomsbury Australia for review. Yet another two star read for yours truly. I seriously don’t know what’s going on at the moment with me and my reads – it is thoroughly disappointing that I am reading so many mediocre books at the moment, especially when they have great potential, like Starry Nights did. I was immediately interested in Starry Nights, back when I read a book by the same author earlier in the year. Paintings that come to life? A guy who falls in love with one? That SCREAMS Chiara all over it. And yet – I was disappointed. I felt that the romance moved too fast and the plot moved too slowly. Sometimes there were things happening and I didn’t know why, like the introduction of a certain character/spirit. I had no idea why they were included, nor what they added to the storyline. I wasn’t swooning over Julien at all; in fact I found him quite pretentious as times, which is a huge turn-off. I didn’t feel the romance between him and Clio, and was overall severely disappointed in this book. 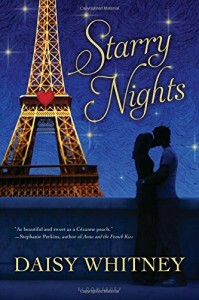 I’d say the best thing about Starry Nights was the character Bonheur – he was the only thing in this novel that truly came to life.